9 FINGERS is a stylish, self-conscious and fascinating movie but one that ultimately fails to cohere. It's a fun idea but stretched too far. As the film opens, our protagonist Magloire (Paul Hamy) is standing in a moodily lit train station. The mood is one of film noir meets Indiana Jones. 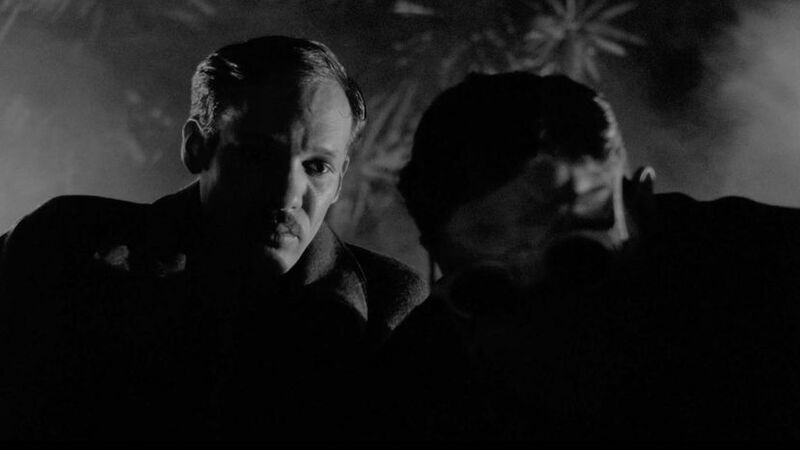 Shot in black and white, 9 FINGERS features a lot of men smoking, wearing macs, with pencil moustaches. It's like the bad guys in Tin Tin got a movie. The action kicks off as Magloire is chased from the station by the police, is given a bunch of money by a mysterious stranger, and then gets taken up by a gang of criminals led by the charismatic leader Kurtz (Damien Bonnard - DUNKIRK). There's a hold up and a MacGuffin like plan to somehow get some polonium, and before we know it we're stuck in a claustrophobic freighter with Pascal Greggory's philosophising gang member, discussing the disappearance of Kurtz, the mysterious "9 Fingers" and a never-ending journey to Nowhereland. How much you enjoy this film will depend on how far you are willing to let yourself be enveloped by Simon Roca's beautiful cinematography and the darkly comic existential non sequiturs. I could easily see how the entire exercise could grate on viewers impatient for an actual point to the film. I found myself oscillating between the two, at once admiring the film's beauty, it's love of genre cinema, and it's wit while also become more and more frustrated about where if anywhere it was going. This is clearly a film for people with a sense of mischief and a tolerance for meandering subversive homage. 9 FINGERS has a running time of 99 minutes. The film played Locarno 2017 where FJ Ossang won Best Director. It is playing the BFI London Film Festival 2017 and there are still tickets available for all three screenings.